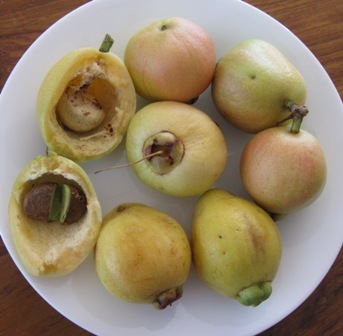 Common names: Rose apple, Malay apple, Malabar plum, jambu, champakka and pomarrosa. Gulab jamun is a native to South East Asia but is naturalized in India, especially in South India. 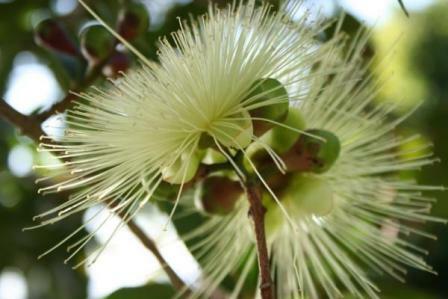 It grows wild and is also cultivated in humid as well as rid tracts of South india, upto an altitude of 1350 m. In india, it is also seen North Bengal, Assam, Manipur and Naga hills. In Jamaica it grows from near sea-level up to an altitude of 3,000 ft (915 m); in Hawaii, from sea-level to 4,000 ft (1,200 m), in Ecuador, to 7,500 ft (2,300 m). It has also been introduced across the Americas where it now grows in wild thickets. Specimens have been planted on nearly every continent. 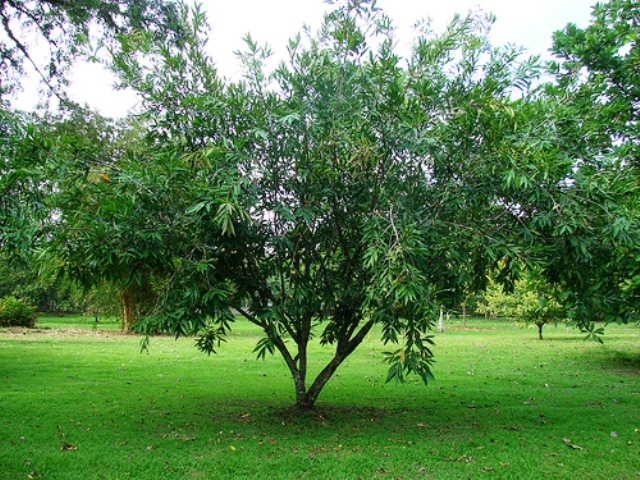 A handsome, evergreen, spreading tree, 9 m or more in height. Leaves lanceolate, 12.5 to 20 cm long, narrowed into shorter petioles, new leaves wine coloured. Flowers greenish white, borne in sort, terminal, racemose cymes, 7.5 to 10 cm in dia, showy with numerous, long, yellowish white stamens. Fruits globose, 2.5 o 5 cm wide, pale yellow to pinkish white. Seeds 1-2, grey, loose in cavity of succulent pericarp. The fruit is as big as a mall apple. The flesh is crisp, rose flavoured but not very tasty. The fruit is eaten fresh. It has a pleasant flavour. It is also used for making candied fruits. Analysis of the edible portion of the fruit carried out in India, gave the following values (g /100 g edible pulp): moisture, 89.1; protein, 0.7; fat, 0.2; fibre, 1.2; other carbohydrates, 9.7, mineral matter, 0.3; vitamin A, 235 IU, thiamine, 0.01 mg; riboflavin, 0.05 mg; nicotinic acid, 0.4 mg; vitamin C, 3 mg and folic acid µg. Gulab jamun tree grows best on the sides of canals, tanks and streams. Long periods of drought are harmful for this fruit. In Jamaica, it is naturalized from near sea-level up to an altitude of 3,000 ft (915 m); in Hawaii, from sea-level to 4,000 ft (1,200 m). In India, it ranges up to 4,400 ft (1,350 m); in Ecuador, to 7,500 ft (2,300 m). At the upper limits, as in California, the tree grows vigorously but will not bear fruit. This tree is propagated by seed. The seed is polyembryonic and 1-2 plants. Seedlings are found near parent trees during the rainy season and are also collected from such locations. Vegetative propagation is possible by air layering. The layering is done during the rainy season in July and the layers are ready for planting in October November.